The term ShopAtHome refers to a website offering a variety of links to online shops and a browser extension that alters the settings of the browsers and displays third-party advertisements and coupons. If you are reading this report, you are probably dealing with the ShopAtHome extension, and we recommend that you remove it from the computer as soon as you can. The extension is compatible with Internet Explorer, Google Chrome, and Mozilla Firefox. Once installed, the extension creates a toolbar featuring a search box, and links to many websites related to shopping and discounts. Moreover, ShopAtHome displays commercial advertisements in order to help you find the best online deals, but we recommend that you remove it from the computer. It is important to mention that ShopAtHome is distributed alongside freeware; hence, it is crucial to pay close attention to every installation process so that you can decline additional programs that you are offered to install. 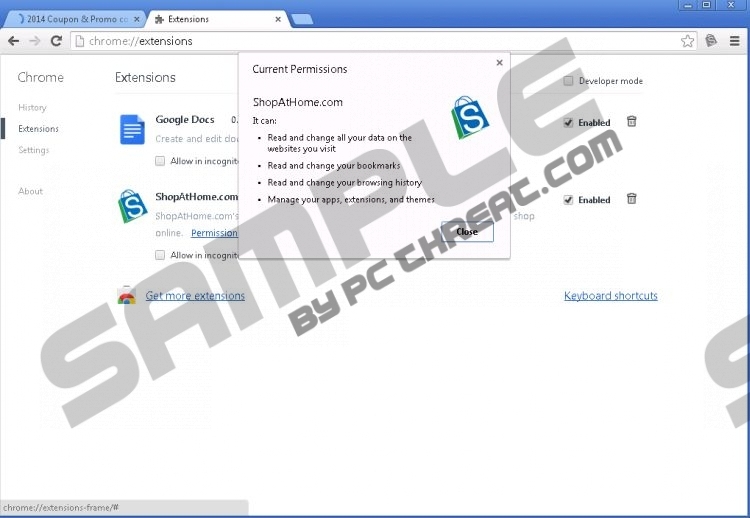 ShopAtHome may be bundled with adware programs, which means that some additional pop-up windows may be shown on the screen. Moreover, it is crucial to keep the system protected, because there are many malicious programs that can access the system without your permissions. The ShopAtHome extension should be removed from the computer because it is capable of making some changes on your browsers and operating system. For example, it records browsing history and reads your information on various websites. Additionally, the extension may alter the settings related to your extensions, applications, bookmarks, and themes. Some third-party tracking technologies may be used, too, which is why we urge you to remove this extension as soon as you can. The ShopAtHome extension also creates its icon on Google Chrome. A single click on the icon provides you with access to quick access to Shopathome.com, online coupons, and other websites. If you do not want to be provided with pop-up advertisement and keep the ShopAtHome extension on the browsers, simply remove it. Our team recommends that you implement a reputable anti-malware program that can eliminate the ShopAtHome extension and safeguard the system against multiple threats. It is possible to remove ShopAtHome manually, but the procedure takes some time, and, after uninstalling the unwanted program, the system still remains unprotected. If you want to be secure on the Internet, implement SpyHunter. This real-time security program can easily eliminate the unwanted program and safeguard the system against Trojan horses, fake anti-virus programs, browser hijackers, ransomware, and many other threats. Click the Start button on the lower-left corner of the screen. Click the Add or Remove Programs option. Select ShopAtHome and click the Uninstall button. Select Uninstall a program and remove ShopAtHome. In order to make sure that ShopAtHome is fully removed from the computer, install the scanner available below. If you have any questions concerning the use of the recommended scanner, feel free to leave a question below. Quick & tested solution for ShopAtHome removal.